As the medical world moves rapidly toward digital recordkeeping, physician information portals – like those created by DDA Medical – can put your hospital or medical office on the cutting edge. Customized physician information portals can streamline daily recordkeeping, make business processes more efficient, and minimize mistakes often caused by lost information or a lack of communication between physicians and facilities. Physician portals give doctors and clinicians a simple, efficient interface to access medical information from nearly anywhere. With a safe and secure login, healthcare professionals can access lab and medication history, patient complaints, prescriptions and medication, allergies, and other critical information. This increases efficiency, maximizes patient satisfaction, and can even allow for secure discussions between physicians about sensitive patient information. At DDA Medical, our team of experienced programmers has developed countless custom applications, and works closely with every client to create the perfect solution for your specific needs. We are also up to date with all rules and regulations included in the Health Insurance Portability and Accountability Act (HIPAA), and program the appropriate security measures into every portal and medical application we create. At DDA Medical, our custom programming applications are truly customized to your needs, allowing us to create a physician information portal that maximizes the efficiency and effectiveness of your healthcare practice. As the medical industry moves toward digital recordkeeping, physician information portals – such as those created by a leading medical marketing company like DDA Medical – can put your hospital, healthcare practice, or medical office on the cutting edge. With a customized physician information portal from DDA Medical, you can make your organization more efficient, streamline regular recordkeeping, and minimize the kind of mistakes often caused by misplaced information or a lack of proper communication between physicians or facilities. As medical marketing strategies and marketing materials for physicians continue to evolve – especially those involving Internet and online marketing – DDA Medical continues to set the standard for professional medical marketing and advertising. With a physician portal from DDA Medical, doctors and clinicians can have access to an easy-to-use, efficient interface that allows them to access sensitive medical information from anywhere with an Internet connection. With a safe and secure login, healthcare professionals can access all kinds of patient information, including lab results, medication history, patient complaints, prescriptions, allergies, and other critical data. This streamlines communication between doctors, nurses, and other professionals; maximizes patient satisfaction; and can even allow for secure discussions between professionals about sensitive patient information. Unlike nearly any other medical marketing agency or group, DDA Medical boasts a wide variety of specialists all under one roof. Our experienced programmers will custom-build your physician information portal, working closely with you to include exactly the features that you need, while leaving out those that you don’t. We also stay up to date with the latest rules and regulations included in the Health Insurance Portability and Accountability Act (HIPAA), and include all appropriate security measures in every physician portal and medical application we create. With years of experience in custom programming and online applications, the programmers at DDA Medical pride themselves on working closely with every client to create the perfect physician information portal to maximize efficiency and effectiveness. At DDA Medical, we are uniquely positioned among medical marketing companies to provide all of your medical marketing needs under one roof. 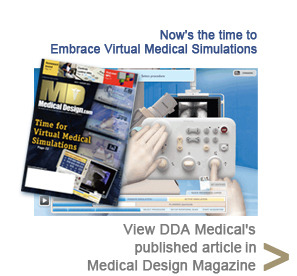 Whether you’re marketing to physicians, developing a pharmaceutical marketing strategy, launching medical equipment or product marketing campaigns, or creating a plan for physician practice marketing, the professionals at DDA Medical will work with you to create customized marketing materials that fit all your needs. Contact us today and let DDA Medical help you develop the perfect physician marketing plan.